My first experience of combat was nothing to be proud of. Chance and death hangs in the air after every gunshot is fired, or shell falls. The sheer realisation that a lot of the happenings are out of your control is terrifying, and freeing at the same time. Lives have been frozen by the war, and plans for after their service finishes are a common point of discussion. Despite the ongoing chaos and terror, soldiers live, laugh, and love, all with a tenacity that comes from knowing you may not get a chance to do it tomorrow. 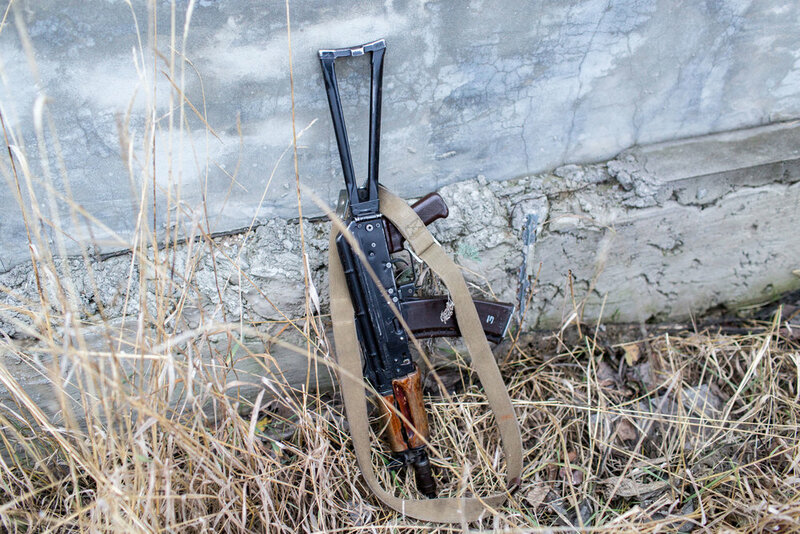 The sounds of weapons like this AK-47 variant become oddly normal. The first time any sort of projectile came close enough to me to hear it, it sounded like a very fast whisper, then a zipping, cracking sound. We took cover behind a low wall, and then branches only metres from us broke. There isn’t much time to think, you just do your best to remain calm, and keep going. Laughing helps. This structure is one of the tallest, most prominent points in the immediate area of Pisky. Following fighting for the town, Ukrainian soldiers climbed to the top and let the blue and yellow flag fly. “Separatists started shooting at them when they saw it,” one Ukrainian soldier told me, “they didn’t like it," he finished, while laughing. ‘Termination of employment by redundancy.’ I read the sentence a few times. This was my first permanent role; stability I clamoured for. I spent almost three years bouncing in and out of forgettable jobs and finally, I had my comfortable office job on Collins Street. I believe the Western life truly is one of compliance: go to school, get a job, marriage, a children, a house, a lifetime of debt. Make sure you buy a couple of cars on credit. That is the stable thing to do. Each day I commuted to work I would look around, a sea of faces all as miserable looking as the one beside them. It was nightmare, but I was awake. There was no room for my dreams or hopes while I spent the majority of my waking hours slaving to the benefit of someone else. It had been my dream to do important work like this for years, but I knew I had to pursue it, or watch it remain exactly that. I write this as I stand outside of a hotel on a cold morning in the Government-controlled Ukrainian city of Kramatorsk, 50 km from the frontlines of a WarZone. Like many villages and cities in the Donetsk region, Kramatorsk was host to intense fighting against pro-Russian Separatist forces, events that preluded a war which would claim the lives of over 9,000 people. A taxi pulls up, and the driver steps out to greet me. After plane flights around the world from Melbourne, and a six-hour train from Kyiv to Kramatorsk, this was the last leg of my journey to embed with Ukrainian forces, on the outskirts of a small village called Pisky. The driver lights a cigarette, the smoke rising against the cold air. We load my camera gear, clothes, and body armour into the car, and getin. I reach over and clip in my seatbelt; his hangs idly. A radio crackles to life and the familiar introduction of Thunderstruck fills the car. “AC/DC,” I say, to which he gives me a huge smile, thumbs-up, andhits the accelerator. The drive is bleak yet erratic. We dart in and out of vehicles, at one point narrowly avoiding a head-on collision with a truck. I remember thinking, “Am I going to die in this taxi?”. Stepping out onto the frontlines after the two-hour drive was an oddly welcome moment. Despite the current cease-fire agreement, I immediately notice the sounds of small-arms fire and explosions in the air. “The cease-fire isn’t working,” one Ukrainian soldier comments when I arrive at a position, “Bang bang bang.” He says, as he points towards the sounds. 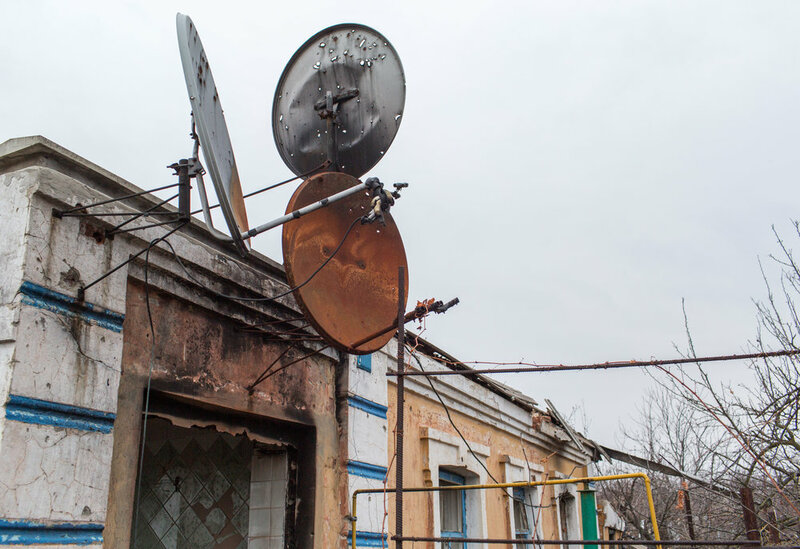 Violations of the cease-fire and skirmishes are a daily occurrence on the frontlines, which see Ukrainian soldiers regularly wounded and dying in conflict provoked by Separatists in the region of Donetsk. Despite these violations of agreed cease-fire terms and wholly avoidable deaths, Western media has all but forgotten Ukraine’s frustrating plight; the lure of Syria’s geopolitical crisis provides the striking images filled with explosions, menacing figures donning headscarves, and burning fighter jets falling into mountains. On my first day I am taken into Pisky. The scarred hulls of old structures litter the outskirts. One stands much taller than the others a Ukrainian flag flies on the top. “Soldiers climbed this building and placed that flag,” my guide says, pointing at the rusted structure, “Separatists started shooting at them when they saw it. They didn’t like it.” He laughs. After walking down a road, incoming rounds crack over our heads.Bullets pierce bushes a few meters to our side. “Run!”Taking cover behind a wall I ask if being shot at still scares him. “No,”he says, “just a lot of adrenaline.” he finishes, pointing at his heart, whilst lighting a cigarette. I wasn’t in Melbourne anymore. Images were taken in Pisky, Ukraine. Homes that were once full of life sit empty and abandoned. Fences and walls are riddled with shrapnel from the constant artillery barrages, mortars, rocket attacks, and tank shells. In a town that was once home to thousands, only a handful remain with nowhere else to go. Whether in the rain or cold, sun or snow, cigarettes were there. Shortly after taking fire I asked if being shot at still frightened my guide. “No,” he said, “just a lot of adrenaline.” He lit this cigarette, and the sound of inhaling the first drag was audible over the gunfire and booms around us. Civilian structures rapidly became military positions. Where people may have looked at scenic views, sandbags, broken windows, and machine gun nests remain. Like many of the taller houses and buildings in Pisky, the walls of this building are sprayed with damage from shrapnel and rocket attacks. Pisky was once a summer getaway hotspot, but now lays in ruins. Certain roads are are regularly preyed upon by Separatist snipers hundreds of metres away. I record a conversation between two soldiers; one asks the other how he is, “Still alive", he replies. It’s surreal, bittersweet humour, but the most humble representation of a frozen war with no end in sight.